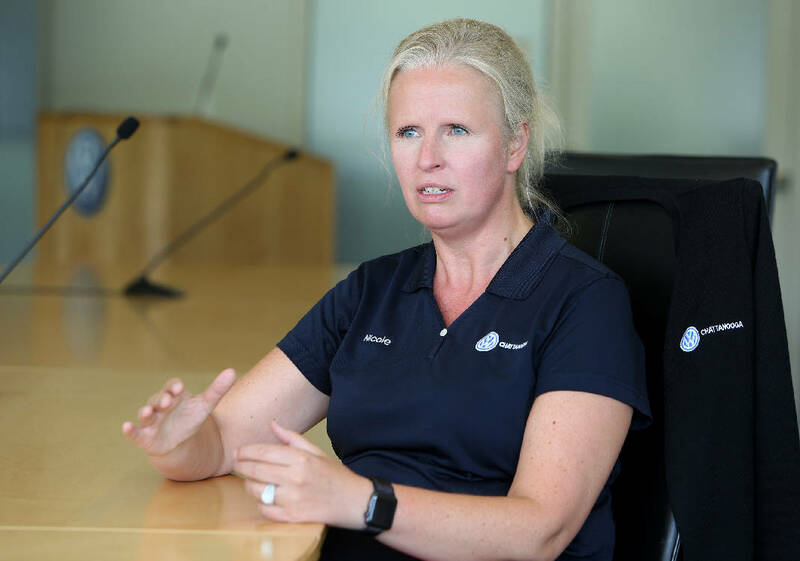 Nicole Koesling, the senior vice president of human resources at Volkswagen, talks about her job at the Volkswagen Plant Wednesday, July 11, 2018 in Chattanooga, Tennessee. Koesling has worked in the human resources department at Volkswagen plants in several countries, including Germany, China, France and the United States. Nicole Koesling is the last German in the top management team at Chattanooga's Volkswagen plant — a big change from the time the factory opened in 2011. "At the beginning, a lot of Germans brought expertise and equipment," says the plant's senior vice president for human resources. "To build a Volkswagen is not so easy." Over the years, however, the German leaders were sent to other assignments and Koesling believes it's time "to make our own experience and have a multi-diverse culture here. We're one region — the North American region." Staff photo by Erin O. Smith / Nicole Koesling, the senior vice president of human resources at Volkswagen, talks about the employee training process at the Volkswagen assembly plant in Chattanooga. 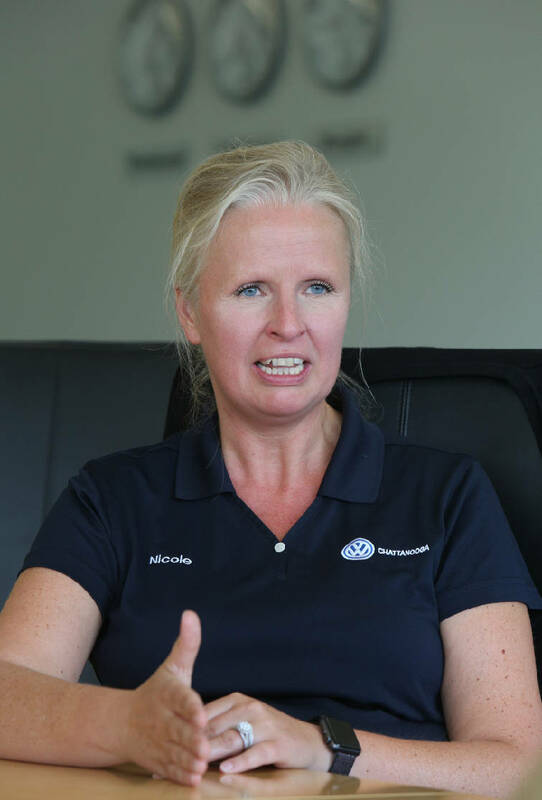 Koesling, 41, who joined VW in 2003, has worked in Wolfsburg, Germany, where the company has its world headquarters as well as in China and Poland. Also, she worked in France with Faurecia, a major automotive supplier. In China, she helped with the set up of a new plant where she established the human relations office. "The Chinese culture is totally different," Koesling says. She regrets, however, that she didn't learn to speak Chinese. "I was never able to speak to employees, to people on the shop floor." Koesling, who came to Chattanooga in March 2017, says the Enterprise South industrial park plant can learn a lot from people who've worked at VW's Puebla, Mexico, factory, which is the second largest within the German automaker. "They have so much experience," she says. "It makes more sense to bring them in. I'd like to localize this plant." Antonio Pinto, who is chief executive officer of VW's Chattanooga plant, says much the same thing. Pinto, who himself came from Puebla, says that the factory is "a mix between different nationalities." "We have a well-connected plant," he says. Koesling, who speaks English well, says she likes living in Chattanooga, though the humidity "is sometimes pretty rough." "I'm an outdoor person," she says. "I run at 7 a.m. before the humidity." The Volkswagen official likes that the city's size permits manufacturing leaders to sit down, discuss problems and "work with each other and not against each other. This is something Chattanooga needs to keep." One challenge for all manufacturers is with the local workforce, and Koesling says she's not seeing the trained people she needs to hire for the plant. "I don't get the skilled workforce," she says. "We have to invest a lot in training. If they don't have the skills in industrial work, we have to train them." Koesling says one way to improve the workforce is to import skilled people from other places, but doing so depends on making the Chattanooga area attractive to them. "We talk a lot about that at the [Chattanooga] chamber," she says. "You need to promote that, the advantages Chattanooga has." Locally, Koesling says, there's the need to attract students at an early age to the idea of working at a plant such as VW's. She says the elabs, a VW-sponsored initiative that allows middle and high school students to gain access to technologies such as automated manufacturing equipment and 3D printers, teach students early on that "this is a good job." Also, to help VW meet its future workforce needs in the Chattanooga area's low unemployment environment, she may recommend hiring directly to the automaker rather than having personnel work first for a contractor. VW's wages and benefits are better, she says.